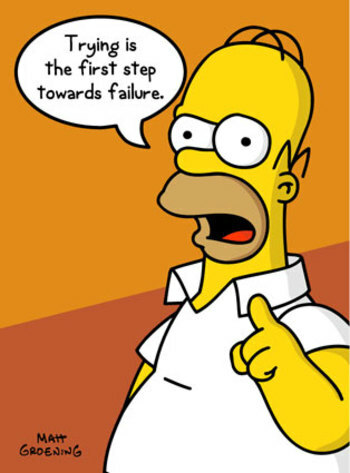 Homer is right. The only way to avoid failure is to do nothing. But failure has virtues, and is probably impossible to avoid (Indeed, doing nothing is a form of failure too). There is no learning without failure. No creativity without failure. That is why Jeff Pfeffer and I argue that the best single diagnostic question you can ask about an organization is: What Happens When People Fail? As research on creativity and learning shows (see this story on the “July effect” in study by Robert Huckman and Jason Barro of 700 hospitals over 8 years – mortality rates went up 4% when the new residents came in), it is impossible to do anything new or learn anything new without making mistakes. Diego and I, in teaching our first d.school class on Creating Infectious Action, initially tried to put too pretty a face on failure. We talked to the class about treating everything as a prototype, which we believe in strongly. We preached bout failing forward, failing early and failing often, and used a a host of other pretty words to talk about the good things that happen when things go badly. Yet these is no denying that going down a failed path is still no fun, even if it is a short journey. So after out students --- under our guidance – were especially unsuccessful at promoting a hip-hop concert (despite trying very hard, look at this cool poster one team made), we realized that the most honest thing to do was to deal with our feelings of disappointment, to talk about how much it sucked to have such a lousy outcome, and then turn to the learning. There is a silver lining, however, although it hurts, there is evidence that people think more deeply and learn more after a failure than a success. Homer might not like the thinking part. Treating everything as a prototype is one way to look at learning. In my work, I've called it treating trials as experiments. With an experiment you win every time because you learn something about the hypothesis. That sounds good, and it can work, but it's hard to get past some of the basic psychobiology. Negative, dangerous stuff imprints more deeply than happy stuff. Hi Bob. Great insight, as usual. Nearly every time I read your blog, or one of your books I come away wishing someone would study these concepts in the context of corporate IT departments - technology departments that support a business rather than technology as a business. IT departments fail so regularly you'd think they would have learned how to fail in healthy ways, but they haven't. Instead, they respond to failure in all sorts of insane ways like spinning, blaming, witch-hunting, arm-chair quarterbacking, and even lying. A few years ago I discovered a way to end all of this unhealthiness whenever I was involved in a failure. It's simple really - just talk about my role in the failure, things I should have done but didn't, admitting I made mistakes, and talking about how that contributed to the failure. Every time I do this, two things happen, and one thing doesn't: 1) Somebody tells me they think I'm brave (I find this strange) 2) Everybody stops looking for a scapegoat or some way of absolving themselves of blame, even if they come short of admitting their role in the failure, and 3) I don't get fired.